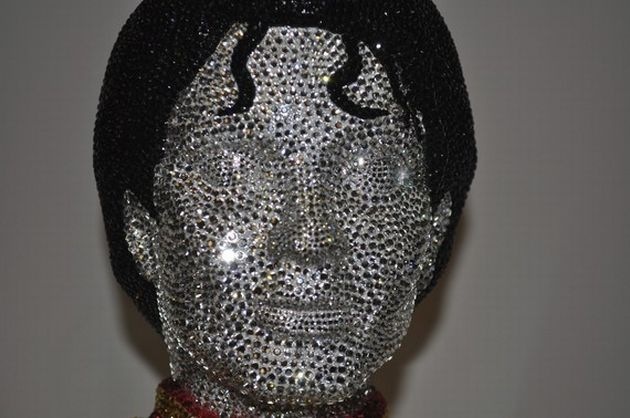 A statue completely covered with Swarovski crystals was created for the commemorating of Michael Jackson’s first death anniversary by Paul Smyth who operates under GalaxiaCrystalArt .The 28cm high statue is studded with a total of 14,800 Swarovski crystals. It took almost 100 hours of very careful and patience hard work to create this one time only piece. This piece has a black solid marble base that has a silver plaque with solid black engraving saying:”Michael Jackson 1958-2009″ . Only one of these was created as it was all done by one person . Fans of the legend can enjoy this beautiful way of remembering MJ.